A ripple effect from the rise of Middle Eastern oil, Latin American governments experienced phenomenal growth from the 1950’s into the 1970’s. However, this came to an abrupt halt. Unfortunately, even with impressive economic growth, Latin American countries like Brazil and Ecuador continued to rack up external debt. Given the new found global capital from petrodollars, Latin American governments found willing lenders. External debt in Latin America rose 1,000% from 1970 to 1980. When a global recession sparked by the Iranian oil crisis buffeted world economies, most Latin American governments simply could not keep up. Eventually, these governments would have to commit to significant restructuring of their economies to reduce their debt. A bit of a weird event. 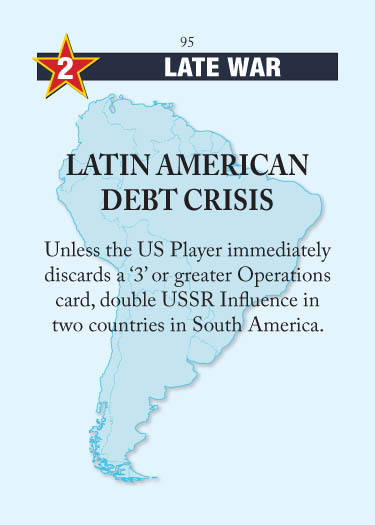 It’s not nearly as good as an event that requires the US to discard a card (e.g., Aldrich Ames Remix), because the US will only discard to Latin American Debt Crisis if it doesn’t lead to DEFCON suicide. LADC tends to get better as more influence is added to countries — for example, it’s clearly a lot better if Brazil is 6/4 rather than 3/1. But it’s rare to see South American countries with that much influence from both sides. If they are, then this event can be an easy way to put some pressure on the US if you don’t have many other options. If they aren’t (i.e., LADC doesn’t pose a threat to the US position), then don’t bother with the event. You can usually find a time to play this event where it doesn’t have much effect. (“Oh darn, Chile is now 0/10 instead of 0/5.”) It’s still annoying even when applied to a USSR-controlled battleground, since it eliminates any possibility of temporarily breaking control, so it’s worth a trip to space, just at very low priority. Of course, you can also use this to voluntarily discard a bad USSR card. Ordinarily you don’t want to cut your hand size, but if you’ve already spaced something else this turn and don’t want to hold a card to next turn, this can be a good way to deal with Muslim Revolution, OPEC, etc. This entry was posted in Late War, USSR Events and tagged latin american debt crisis. Bookmark the permalink. A friend of mine (USSR) spent 2*3 Ops to get US-controlled Argentina and Brazil to 2-2, 2-2. Then he played this, and since I didn’t have a 3-Op left, he doubled up to 4-2, 4-2. I’m not sure whether this was a good use of Ops/time, but it definitely worked on me. (Although mainly because a) I forgot this card existed [not something you can say of CIA created, TDTWall etc.] and b) I had a low Ops hand.) Still, an unusual use of this card.